Despite clear proof that Jewish influence destroyed from within the great civilizations of Egypt, Greece, Rome, France, Russia and Germany, citizens of the United States remain essentially blind to this same catastrophic threat that has prostituted their own government and is about to eviscerate their own country. Now totally controlled by rich international Jews, the world perpetually teeters on the brink of war while governments poison their own people, trying to pay off shrewd debts that never really end to their Talmudic overlords on Wall Street and in the City of London. The American mind is hopelessly deluded by Jewish education, Jewish media, and politicians owned by Jews, all eager to fund projects for Israel and build more Holocaust museums at the expense of now impoverished Americans, who have been deliberately made sick by Jewish medicine and Jewish entertainment. Americans can’t — or the media won’t let them — see the continuing crimes of Jews on Wall Street stealing our money by the trillions, Jews in the White House provoking foreign wars that don’t benefit America, and Jews controlling the business world with poison products in concert with drugs they invent to cure the diseases they’ve created. Yet when you try to discuss the obvious elephant in the living room of the world, most people cringe and don’t want to talk about it, probably not realizing that, at this point, talking about this is the only way they have even a remote shot at saving their lives, their liberty and freedom of thought having been completely revoked in the autumn of 2001. I am honored to have some highly intelligent friends whose acumen in their fields dwarfs my dilletantish generalized tourist credentials in a broad spectrum of subjects pertaining to the human condition. One item that almost always comes up in our conversations is this. How can it possibly be that . . . in a world full of incredible leaps in knowledge and new levels of understanding in virtually every area of science and technology . . . the brightest minds have no clue about the real power structure of the world, even though it’s obvious and paraded daily right before their eyes? How can people not see? The world that unfolds before our eyes is scripted from cradle to grave to conceal the real operators of the system, the bloated moneycrunchers behind the bankers behind the politicians we get to vote for when they are selected for us by this same process. The information we ingest is created as carefully as that newspaper story that says all is well and tells you nothing about what it is really pretending to talk about. The skills we learn pertain only to our moneymaking ability, and the ethics and morals of the crafts we master are reduced to questionable production methods in our headlong dash to the bottom line. The entertainments we pursue are crafted by spinmasters according the Talmudic principle of gradually poisoning by any and all means necessary all those who oppose the insane Jewish monolith, Moloch posing as Yahweh, the beast in control of all the guns in the world. This is the question my friends most often ask. What is it that makes the Jewish threat, which has plagued the world since civilization first congealed into villages, so invisible to those who are its victims? Is this a willing blindness, or is it inculcated? What makes it so acceptable to those who take its paychecks even though they know the yacht they’re piloting and the coke they’re snorting was purchased at the expense of Congolese cannon fodder and Afghan practice targets, human beings gunned down for sport, collateral damage in the Homeland Security League, just a paycheck for those with the right credentials? What makes it so mind-deadening to folks reading along at home is that there is no glimmer of hope in any direction, only the creeping mindlock of acceptable thought spreading like an ink stain through the world mind, dripping on innocent, sneezing bystanders the poisonous chemtrails which make you sick and keep you sick. And still people are afraid to say anything. You’ll lose your job, if you still have one. And your friends, the ones who like to keep quiet, don’t want to be around you anymore for fear some authority will want to know who you’ve been been associating with. This is the dark shadow coming at you out of your blind spot. You’ve done your best to ignore it all your life, but you can’t afford not to look at it anymore. What we have chosen not see is the puppetmasters who jangle our strings, the educators who twist our minds against our own country, the musicians who fail to sing the truth because it will keep them off the stage, the moviemakers who plant the seeds of poison products in our brains, and the writers and reporters who can only tell so much of the truth they know before their paychecks start going in the wrong direction. 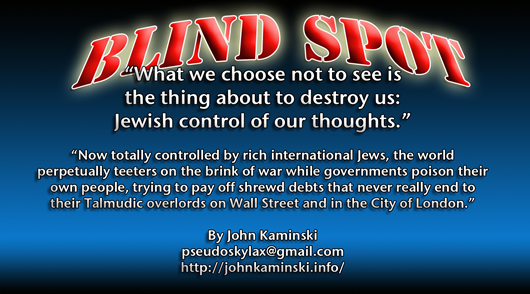 What we have chosen not to see is the shadow of control which has dogged America since its creation, always with the same culprit at the controls, big money Jews buying politicians who make laws guaranteeing the financial fraud that makes them rich and us poor. What we have chosen not to see is the very fiber of thought processes has been manipulated and mutated by Freud, Marx and Einstein into a nihilistic matrix of chaotic destabilization and sabotage, which derives from the core teachings of the Jewish Talmud. The world doesn’t have to be this way. And yet the men with the guns say it does. This whole problem is absolutely due to one simple precaution that civilizations have failed to take down through history. And that is, they have not read the Talmud. Now you can’t find the Talmud at your local drugstore. Jews try to hide what’s in the Talmud from everyone, because it’s so horrible, if everybody in the world realized what is actually in the Talmud, Jews wouldn’t be safe anywhere. And ironically, if that situation arose, everybody else would be safe — or at least safer than they are now — everywhere. And that’s why they call it a blind spot. John Kaminski is a writer who lives on the Gulf Coast of Florida preaching the message that no problem in the world can be authentically addressed without first analyzing tangents caused by Jewish perfidy, which has subverted and diminished every aspect of human endeavor throughout history. Badly needed support for his work is wholly derived from people who can understand what he’s saying and know what it means.